Zotero aims to be a digital research platform, and an extensible one at that. That’s why it’s gratifying and exciting to see the brilliant and incredibly useful Vertov plugin for Zotero. 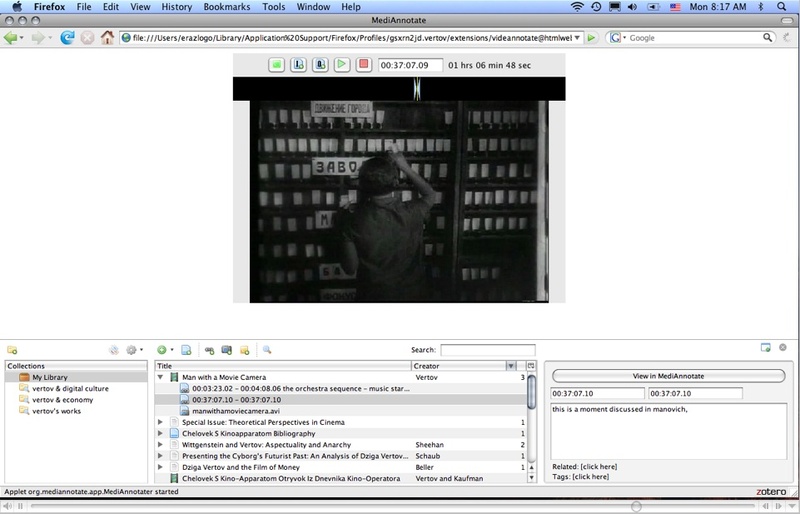 Vertov allows Zotero users to cut video and audio files into clips, annotate the clips, and integrate their annotations with other research sources and notes stored in Zotero. It has terrific functionality and should be ideal for use in the classroom as well as by film scholars and other researchers. Congrats and many thanks to Concordia University’s Digital History Lab, led by Elena Razlogova, for conceptualizing and executing this great plugin. And since it’s been a little while since I’ve done shameless cheerleading for Zotero, it’s humbling to get the recognition from PC Magazine that Zotero has, for the second year in a row, been declared one of the best free software applications.